William Caxton, to whom England owes the introduction of printing, was born, according to his own statement, in the Weald of Kent. Of the date of his birth nothing is known with certainty, though Oldys places it in 1412. Lewis and Oldys suppose that between his fifteenth and eighteenth years he was put apprentice to one Robert Large, a mercer or merchant of considerable eminence, who was afterward, successively, sheriff and lord mayor of London, and who upon his death, in 1441, remembered Caxton in his will by a legacy of 20 marks. 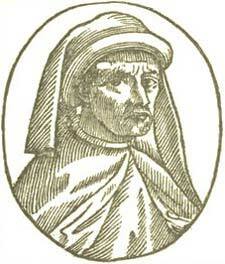 Caxton at this time had become a freeman of the Company of Mercers. His knowledge of business, however, induced him, either upon his own account or as agent of some merchant, to travel to the Low Countries for a short time. In 1464 we find him joined in a commission with one Robert Whitehill, to continue and confirm a treaty of trade and commerce between Edward IV. and Philip, Duke of Burgundy; or if they find it necessary, to make a new one. They are styled in it ambassadors and special deputies. 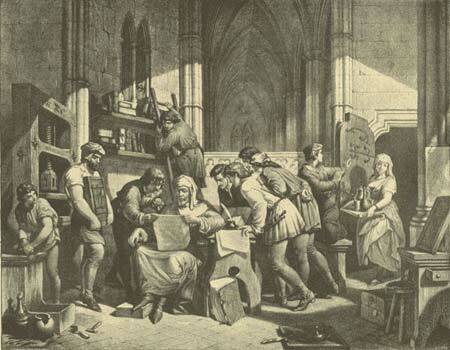 This commission at least affords a proof that Caxton had acquired a reputation for knowledge of business. Seven years afterward Caxton describes himself as leading a life of ease, when, "having no great charge or occupation," he set about finishing the translation of Raoul le Fevre's "Recueil des Histoires de Troye," which he had commenced two years before, in 1469. The original was the first book he printed, and this translation the third. Of Caxton's pursuits and travels abroad, we know little more than that in his peregrinations he confined himself, for the most part, to the countries of Brabant, Flanders, Holland, and Zealand, and finally entered into the service, or at least the household, of Margaret, Duchess of Burgundy, who encouraged him to finish his translation of Le Fevre's "History of Troy," assisted him with her criticisms upon his English, and amply rewarded him upon the completion of his labor. From the prologues and epilogues of this work we discover that he was now somewhat advanced in years, and that he had learnt to exercise the art of printing, but by what step he had acquired this knowledge cannot be discovered; his types only show that he acquired it in the Low Countries. He does not appear to have seen any of the beautiful productions of the Roman, Venetian, and Parisian presses before he had caused his own font of letters to be cut. The First Sheet from Caxton's Press. The original of Raoul's "History," the "Oration of John Russell on Charles, Duke of Burgundy, being created a Knight of the Garter," and the "Translation" of Raoul, were, as far as we know, Caxton's first three works; the last finished in 1471. A "Stanza," by Wynkyn de Worde, notices an edition of "Bartholomoeus, de Proprietatibus Rerum," as printed by Caxton at Cologne (about 1470), but the actual existence of this edition is unknown. Nor has more certain information yet been obtained of the exact period of Caxton's return to his native country. The usual supposition has been that he brought the art of printing into England in 1474, and this date is indicated by the figures which are united in the centre of his device as a printer. In 1477, however, he had undoubtedly quitted the Low Countries and taken up his residence in the vicinity of Westminster Abbey, where and in which year he printed his "Dictes and Sayings of the Philosophers." Stowe says he first exercised his business in an old chapel near the entrance of the abbey; but a very curious placard, a copy of which, in Caxton's largest type, is now at Oxford in the late Mr. Douce's library, shows that he printed in the Almonry. It is as follows: "If it plese any man spirituel or temporel to bye ony Pyes of two and thre comemoracions of Salisburi vse emprynted, after the forme of this present lettre whiche ben wel and truly correct, late hym come to Westmonester in to the Almonesrye at the reed pole and he shal have them good chepe. Supplico stet cedula." According to Bagford, Caxton's office was afterward removed to King Street. From the evidence of Wynkyn de Worde, in the colophon of his edition of "Vitae Patrum," 1495, it appears that these "Lives of the Fathers" were "translated out of French into English by William Caxton, of Westminster, lately dead," and that he finished the work "at the last day of his life." His death, however, seems fixed, by two or three entries in the parish accounts of St. Margaret, Westminster, to the year 1491 or 1492, in which we read, "Item: atte bureyng of William Caxton for iiij, torches vjs viijd. Item: for the belle at same Bureyng vjd." Wynkyn de Worde no doubt referred to this time. Caxton, Mr. Warton observes, by translating, or procuring to be translated, a great number of books from the French, greatly contributed to promote the state of literature in England. In regard to his types, Mr. Dibdin says he appears to have made use of five distinct sets, or fonts, of letters, which, in his account of Caxton's works, he has engraved plates in fac-simile. Edward Rowe Mores, in his "Dissertation upon English Typographical Founders and Foundries," says Caxton's letter was originally of the sort called Secretary, and of this he had two fonts; afterward he came nearer to the English face, and had three fonts of Great Primer, a rude one which he used anno 1474, another something better, and a third cut about 1482; one of Double Pica, good, which first appears 1490; and one of Long Primer, at least nearly agreeing with the bodies which have since been called by those names. All of Caxton's works were printed in what are called black letter.